I’ve created a LinkedIn profile…. Now what? You’ve heard from Mary Huston on an introduction to LinkedIn and how to create a LinkedIn profile. 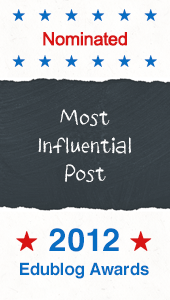 This is Mary’s third and last installment on LinkedIn to help you get the most out of it as a PLN (personal/professional learning network). Take it away, Mary! Okay…you’ve created your account, built your profile, and found a few connections. Now what? When does the networking start? For many months, I had no idea what else I was supposed to do on LinkedIn. My profile sat unattended (and unviewed) and I was disappointed. After deciding to sit down and really look at the site, I realized there was so much more to it than I was using. There were actually groups on LinkedIn. Groups! Who knew? Once I figured that out, I was able to begin using LinkedIn for what it was designed to do – Professional Networking. Thankfully, you won’t have to wait quite so long. At the top of your LinkedIn home page or profile page or pretty much any page in LinkedIn, there are tabs available. These will take you directly to those areas. Hovering the mouse over “Groups” will give several options including: Groups You’ve Joined; Groups You May Like, Groups Directory, and an option to Create a Group. If you click on Groups You May Like, you’ll be taken to a list of groups that are based on your profile. There is a logo for the group, a short paragraph describing the group, the owner, the number of members, and the option to join. There is also a “similar groups” button. If you click on the name of the group (usually in blue), you’ll be taken to that group’s page. There you’ll have the option of joining the group (again), seeing information about the group including any websites that may be linked to the group, and members of the group within your network. The members of the group within your network will be listed by the degree of separation (1st, 2nd). If you click on the name of one of those individuals you’ll be taken to their profile page where you’ll have the opportunity to see their information, add them to your network, or send them a message (although you may need to be a paid member to send them a message). There are many reasons to join a group. Many of the groups are filled with professionals searching for answers, sharing information and resources, and discussing hot topics of the profession. In addition, responding to messages and sharing information consistently in a group is a good way to establish yourself as an expert (or at least almost an expert). Perhaps even more importantly a member can review which individuals are most influential, stay current with discussions, and following influential discussions and members. In addition, some groups have jobs tabs and can be a great way to put yourself in place for a new position. There are a couple of ways to find specific subject groups. 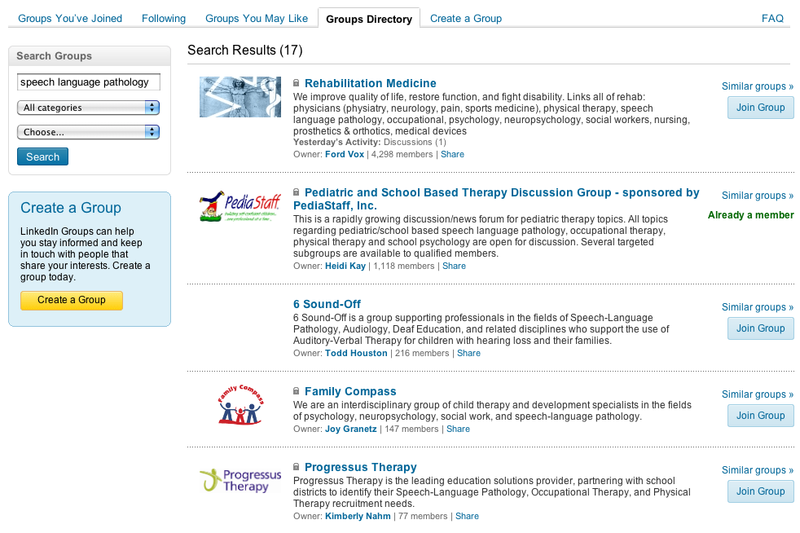 Clicking on the Groups Directory (under the Groups tab) will provide a list of featured groups. On that list you have the option of joining the group, finding similar groups, or just reading over to see all the different groups. Some groups allow any LinkedIn member to join; other groups require members to be pre-approved. Usually, that’s a way to make sure the person belongs in that group. For instance, to join a speech language pathology group, the owner may request individuals to provide information showing they are SLPs and not a spam engine. Some groups also have subgroups within their main group. That allows for a bit of different topic maintenance and diversity without the group being overwhelmed and unwieldy. On the Groups Directory page (and a few others) there is a sidebar titled Search Groups where you can search by keywords. You can narrow the search by clicking on the All Categories widget and changing it to a narrower group (alumni group, professional group, etc.). You can further narrow the field by choosing which language you’d like. Click search and your page will be filled with any available groups. It may be necessary to tweak your search keywords; for instance, Speech Language Pathologist came up with six hits when I looked just now….however, speech therapy came up with 70. Now would be a really good time to watch this video. 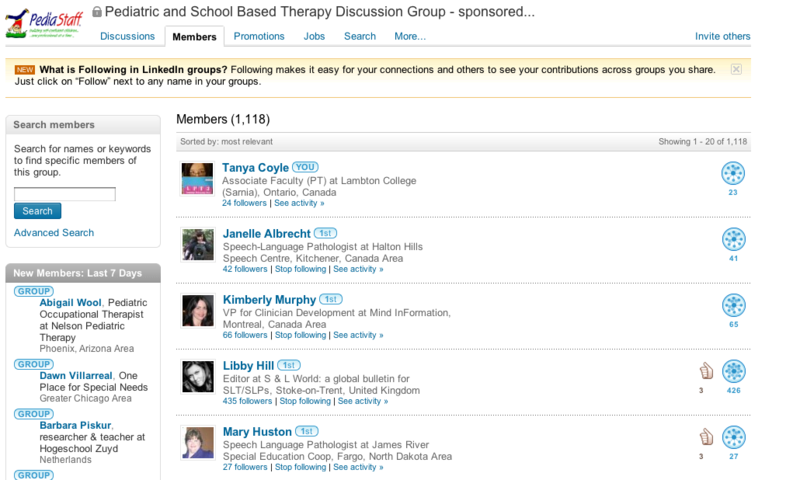 LinkedIn members also have the option of creating groups. To create a group click on Create A Group tab. You will need to attach a logo (after making sure you are not infringing on any copyrights of course), create a group name, determine the type, and write a description. Next you’ll need to determine if anyone can join or if they will need to request to join. One nice feature, is you can allow members of certain emails to invite others or be pre-approved to join. Basically, anytime a member creates or responds to a message, an email is generated. When an individual joins a group they can choose to have emails (messages) sent one at a time or by digest (daily or weekly). A digest version allows for easier handling of the messages which is vital if it’s an active group. For individuals choosing daily digest, all the recent messages are saved and sent in one email each day. Links and headers to all the messages are in the email and the reader can choose which specific message they want to open. Weekly digest allows an individual to receive just one email a week with all the messages intact. If the group is very small and there are only a few messages a month it probably won’t matter a lot. However, some groups can have many messages in a day. I prefer to receive all my messages from LinkedIn groups as a daily digest for easier handling and less confusion. You can manage general email settings by clicking your name in the top right and then clicking ‘settings’. If you start with one message setting and find that it’s not working for you, it can be changed very easily. If you click on My Groups, you will find a list of all the groups you belong to. When you click on the name of the group you will see there are several tabs: Discussions, Members, Search, More. Click on More and you will see a drop down box with Updates, My Activity, My Settings, Subgroups, and Group Profile. If you click on Updates, it will give you a list view of all the recent messages and comments. You’ll also have the chance to just see messages from people whom you follow. My Activities gives you the opportunity to see all your posts and any comments that have been made. To change your message settings, you will want to click on My Settings. If you are on the LinkedIn group page and click on your picture you will see your posts and responses/changes to your post. This is an easy way to stay up to date with your posts and anyone who has responded to you without getting sidetracked by the other messages (which is a very real possibility). You can also change your groups settings from your general settings. There is a LinkedIn Blog for learning about all the new information LinkedIn provides (features, etc.) http://blog.linkedin.com/ . LinkedIn Today provides the most shared news headlines for the day http://www.linkedin.com/today/ . There is also a LinkedIn Blog post specific for helping new graduates (or soon to be) find jobs. http://blog.linkedin.com/2011/03/21/linkedin-student-job-portal/ . A LinkedIn member can choose to have their LinkedIn account and their Twitter account linked. Tweets can be automatically updated to their LinkedIn status. At the bottom of their home page, a LinkedIn member can search for new members within a particular network. 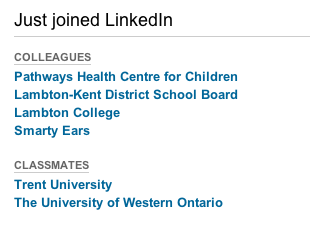 So if someone wants to see if any new graduates of their university are on LinkedIn, the member can click that button and LinkedIn will populate with all the new members of that network. This can be a great way to network with different people who have common backgrounds/interests. I’ve recently been asked if I think LinkedIn is better than Facebook or better than Twitter. The quick answer is no. However, it is different and it fills a different need. In my (not so humble opinion), Facebook (for me – your opinion will vary) is that Facebook is more personal and where I connect with family, friends, and the odd acquaintance. 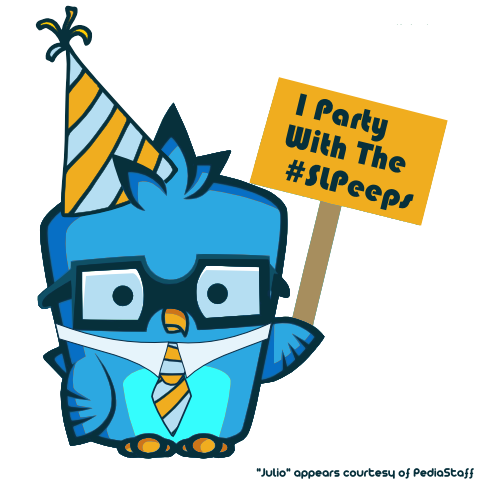 Twitter is where I network with my #slpeeps. All but three of the people I’m following are SLPs or SLPs related on twitter. LinkedIn is professional and where I look for possible job prospects, network in a very professional manner with other professionals, and discuss specific topics. I spend far more time on Twitter than I do on either LinkedIn or Facebook; but all three are important networking elements. This concludes my blog on LinkedIn. I am absolutely positive LinkedIn does more than I’ve talked about here…after all, this was an introduction to LinkedIn, not a comprehensive review. However, you will learn far more by going there…creating a membership…joining a few groups…and actually networking. Enjoy. I can be found in several of the Speech and Language groups or by searching on my name. I look forward to seeing you there. Mary Huston is a speech-language pathologist who works in a school in North Dakota. You can find her on LinkedIn and also on Twitter as @mtMarySLP. This entry was posted in Guest Blog, networking. ← I have a LinkedIn account…now what?